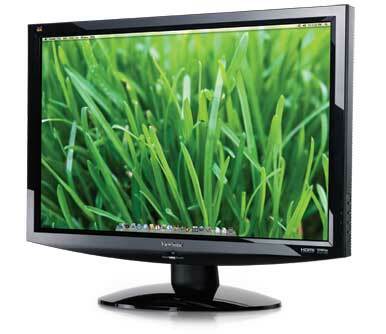 The ViewSonic VX2433wm is a widescreen, 24-inch LCD monitor made with multimedia in mind. With its HDMI input, fast 2ms pixel response time, built-in speakers, and sub-$300 price tag, the VX2433wm looks great on paper. Unfortunately, its fuzzy text and mediocre viewing angle keep it from looking as good when its sitting on your desk. The matte-screened VX2433wm has a shiny black plastic bezel and stand. It offers no height adjustment, can’t swivel, and lacks the ability to pivot--you can, however, tilt the display forward a back a little. The display offers three different inputs: HDMI, DVI and VGA (picture in picture is not supported). We used the DVI connection to connect to our 2.66GHz Mac Pro and the display automatically started up in its correct, native 1,920 by 1,080 resolution. At its default settings the VX2433wm was overly bright, blowing out lighter images on the screen and making blacks look more like dark gray. I got the display to look better by cranking up the contrast a bit and reducing the brightness down from its 100 percent default setting to about 75 percent. The buttons are hidden on the side of the display, which give it a clean look, but makes it difficult to use the menus. Once the display was looking its best, it still only managed a Fair text legibility score, showing somewhat soft and blurry text when compared to other 24-inch monitors we’ve tested. The display’s viewing angle also received middling scores, with a pronounced color shift when moving your head from right to left of center when looking at the screen. The built-in speakers were of mediocre quality; in fact, the speakers on my MacBook Pro sound better. Those looking for an inexpensive 24-inch LCD display may be tempted by the ViewSonic VX2433wm’s sub-$300 price and impressive specifications. But with tinny sounding speakers, less than sharp text and pronounced color shifts when viewing the screen off-angle, the VX2433wm will suit only the easiest to please.